The extremely nice people at Stihl asked me if I wanted to trial a couple of their products. It did not take me long to decide which ones I wanted to try. 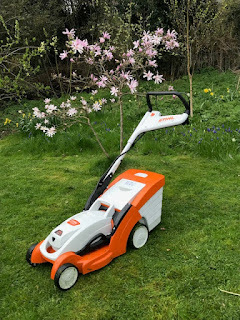 Firstly I shall talk about the Cordless Grass Trimmer, I will write about the other product soon. I had to go to pick up my products from a local dealer. I chose Farol Ltd who are based in Hinckley. They have other branches as well. They do deserve a special mention as they could not have been more friendly or more helpful. Whilst it does not take long to talk through how to use the grass trimmer, they did so and made sure I was happy with it. So I arrived home with the battery, charger and safety glasses. It is surprising how much stuff gets whizzed up into the air by a strimmer and looking daft in some plastic glasses is better than having to get something dislodged from your eye. The trimmer itself is telescopic so you can make it shorter or longer depending on what feels most comfortable. It is quite light, the majority of the weight comes from the battery. It weighs 3.3kg including battery, so that is just over three bags of flour, so not bad. Most importantly it is well balanced, so it is comfortable to use. The battery has a double click system. You fit it into the trimmer and it clicks. This means you can walk around with it quite safely and it will not turn on. When you want to use it you give it a further push and it clicks further into place. It can now be used. There is a handy indicator on the battery so you can see how much charge you have at the press of a button. I liked this as it takes the guess-work out of it. I then wandered out to try out the trimmer. I knew exactly where I needed to try it. ...the nettles were taking over. I have an endless supply of nettles and if you look away for a moment they take advantage. So I trimmed them. All of them. Ta da! This took around twenty minutes. The trimmer has an automatic feed for the trimming-line. You tap the trimmer-head on the floor and a bit more line pops out. This works fairly well but you do have to keep an eye on it. If it gets too short then it will not work automatically. It is quite straightforward to manually increase the feed and as you can click the battery to the safe position easily and quickly it is not a big issue. Trimming the nettles in particular was quite a tough job so I did get through quite a bit of line, but I still have plenty left. The nettle patch looks much better. I am going to keep it more in control now (promise). I feel even more motivated to keep it in control now I do not have to get the extension cable out, unwind it, plug it in etc. I think I am a complete battery convert! At the end of the twenty minutes it took to do the task I still had two bars left. I thought this was rather good. The trimmer is part of Stihl's new cordless range. The really clever thing about this range is that all the batteries fit each other. So if you have two products you automatically have a spare you can have on standby for if you want to do more than just the one battery will allow. I am a great believer in two batteries and not having to buy a special spare I think it is a very good thing. The RRP for the Grass Trimmer is around £200, you can find it for less if you have a shop around. I have nettles like that. First I'll have to check all through them for hedgehogs. I'm using a scythe at the moment. Not easy in a narrow space. I think I could do with your strimmer. I'm enjoying your reviews. All the things I've been thinking of getting, but never knew if they were worth it or not. I have the hedgehog worry also but they tend to keep in the wilder part of my garden (where I don't mind the nettles). This is definitely worth it, it works well & as I am basically very lazy the lack of needing to faff around with electricity is great. 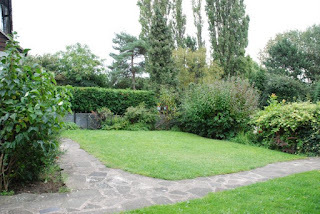 For a domestic garden it is just brilliant. It sounds great, I just wish I could afford it. I have one for about £60 and it's doing OK. But feel I need something tougher in future so will bear this in mind. Thanks!